When I first played at the US Amateur Team East in 2012, my team’s goal was to play in the big room. Just a round or two would be good enough. We did not succeed. Next year, the goal was to stay in the big room. As time went on, we wanted to get behind the ropes and stay there. This year, the goal was to win the mixed doubles prize. We failed in a way none of us had foreseen. The drama began a few months before we made the first move. The USCF misrated an international tournament for a player of a similar name, awarding the points to Aravind. When the USCF made the January official rating list, Aravind’s rating was 26 points higher than it should have been. This is the last thing you want when you are trying to find the best fourth board match while keeping the team average below 2200. Fortunately, Aravind’s father contacted the USCF, and both USCF and Steve Doyle were happy to help. It all got sorted out. Without further ado, off to the tournament! There were 9 boards behind the ropes, and we were playing on board 10. Just one board to go. And we were not the highest-ranked mixed doubles team. Really?? With a 2195.5 average? This round wasn’t too interesting. We won 4-0. We outrated our opponents heavily on board 1-3, and Dexin managed to swindle her opponent on board 4. This is where things got interesting. First of all, our opponents were also a mixed doubles team. Competition! We had rating edges on all boards, especially on boards 2 and 3. Martha won first with a pleasing finish. White to play and finish black off in the most effective way! Here’s the solution. Aravind then dismantled his opponent. We were up 2-0, Dexin was in a little trouble, but I was clearly winning. Match over, right? It wasn’t so easy. I proceeded to completely blow my winning position and having to fight not to lose. You’ll have to wait for my next article to see how I messed that up. Dexin lost. My opponent and I agreed to a draw around 1:30 a.m. Off to bed! Oh well… things happen. Anyway, the team won 2.5-1.5. Behind the ropes for the first time! This was a serious matchup. Out of my teammates, I had the biggest rating edge of 80 points. On a sidenote, my dad won a Chess Informant book by playing “poker” with the serial number on one-dollar bills (his had four 8’s!). When my opponent offered a draw on move 18, I was an itsy bit worse with small winning chances. I decided to take it, a decision I would feel somewhat guilty about in the hours of stress that ensued. When my game finished, Aravind already had a powerful advantage against Boris Privman which he later converted to victory. A critical moment from the game. White to play. How to proceed? Here’s how the game ended. Martha lost an unfortunate game to her opponent. I thought she had decent chances, but what I didn’t know was that she was playing with a fever. Her position went downhill quickly. The match was tied 1.5-1.5, and it was all on Dexin’s shoulders. She was a pawn down but had compensation. Her opponent was toying with repeating moves and then went for a winning attempt. Great. Not. Was a draw the best we could do? She won what turned out to be the most important nail-biting game of the entire match and most likely the entire tournament. 2.5-1.5!!!! We pulled it off. We only moved up by one board?!?! Another tight matchup. Dexin and Aravind had decent rating edges, but they had black. Martha had a slight rating disadvantage and fever, and I had an even smaller rating disadvantage against GM Fedorowicz. Looking around, I saw we weren’t alone in the mixed doubles competition. There were two other mixed doubles teams behind the ropes. Can you believe it? GM Fedorowicz surprised me by offering a draw on move 18. I could have just agreed to a draw and gone to watch Magnus Carlsen’s guest appearance in The Simpsons. However, the team situation didn’t look the rosiest, and I felt guilty enough about my 18 move draws earlier that day. Watch my position spiral downhill. Yeah, I have no idea how I managed to draw that. I was busted on so many occasions it wasn’t even funny. Dexin drew, Aravind won, and Martha lost. The match was tied 2-2. The team had 3.5/4. That was the best performance any of my teams had ever had after 4 rounds. If we played well the last day, we had excellent chances for a prize. Carissa Yip’s mixed doubles team was 4-0, but there was no other mixed doubles team with more than 3/4. Aravind was doing great; he was 4-0. Dexin was holding her own on board 4 and was the heroine of round 3. Martha wasn’t in the greatest shape with her fever, and I needed to get my act together. We were playing on board 5. Moving up one board per round? This looked like a rough pairing. First of all, I was outrated by 200 points and had black against GM Larry Christiansen. Board 4 was playing slightly up which looked like a tossup. The good news was that we had solid rating edges on boards 2 and 3, but anything could happen, especially considering that Martha was sick. The first good news came when Dexin won on board 4. From a seemingly equal position, her opponent allowed Dexin a generous opportunity. White to play. To trade or not to trade? Here’s what happened (it’s instructive). That was a boost! That is my highest USCF rating win. We were up 2-0 and Aravind was winning. At the start, I thought the position was a bit strange, but it soon became clear that Aravind was boss there. See for yourselves. Things got even better when Martha managed to swindle her opponent and win her game before Aravind finished. 4-0! Wow!! That was really unexpected. Going into the last round, we were 4.5/5. Carissa’s team lost, and we were clear first in the mixed doubles standings! If we won, the mixed doubles title was ours and we were extremely likely to win an overall prize. Going into the last round, we were 3rd on tiebreaks. In the past couple of years, 5.5/6 has been enough to tie for first. Last year’s champions, the Summer Academy for Talented Youth, was the only team that was 5-0. I thought we might play them due to colors. We all rushed to prepare. Naturally, I was wrong. Hey, 3 out of our 4 last board numbers were primes! That’s probably a good omen. On boards 2 and 3, we had a big rating edge. Aravind was 5-0; he was in excellent form and had a lot of motivation to beat his opponent. Meanwhile, I was playing another 2600 USCF GM, and Dexin was playing a 2000. The basic plan was to win on boards 2 and 3 and survive on boards 1 and 4. The big match to watch was on board 1: H.A.N.G. Loose vs. The Academy (abbreviation). Because the Academy was 5-0, I was really hoping they wouldn’t win, and we could tie for first. That match was a demolition. The Academy won 3.5-0.5. They won the match even before a single game in my match was done. Big congrats to the Academy for winning 6-0! On board 2, Aravind was the first to win. I thought he was a little worse, but he took educated risks which paid off. 6-0! Monster! On board 3, Martha was grinding her opponent. At some point I honestly didn’t think it would be enough to win, but she pulled it off. My game was a wild ride. I got a solid advantage out of the opening which I didn’t exploit in the best way. Things soon spiraled into complex dynamic equality. Anything can happen here, but black has to be careful not to allow an invasion on the c-file. 31… Re4 would have probably held the balance, but instead GM Arun Prasad went 31… Rd5? letting me get a pawn up queen endgame after 32.Rc4! Qb7 33.Qc3 Rc5 34.Rxe3 Rxc4 35.Rxe6+ Kxe6 36.Qxc4+. Unfortunately, white is most likely not winning there. I tried some things which weren’t so successful. After Martha won, I decided not to do anything stupid and just repeat the moves. I didn’t win this one, but oh well. The draw was enough for the team to win. Compensation for my luck in round 4. Dexin lost, and the team won 2.5-1.5. We finished with 5.5/6. Wow! And this is how we lost the Mixed Doubles prize. Wait a second? Didn’t I just say that a win would give us a clear first in the mixed doubles category? Didn’t we just win? Yes and yes. Yet, we missed the prize. Why? Because we had too many points! To our huge surprise, we ended 2nd overall. If it weren’t for the Academy going 6-0 we might have even tied for first. Since category prizes (with the exception of state awards) are awarded only to those who didn’t place among the top 5, the Mixed Doubles prize went to the next team. As they say, you win some, you lose some. We lost our mixed doubles prize by winning the overall 2nd. Not only do we make the bestest team names (they’re great, don’t you agree? ), we also make great teams. Aravind finished 6-0. Beast. Martha, NM as of yesterday (!! ), wavered only on her fever day and won the rest. Dexin was a rare fourth-board find who saved us in round 3. In conclusion, what did I gain from the weekend? 10 rating points, my highest USCF win, a new clock with a second place plaque, and a Chess Informant book. At the USATE, the prizes aren’t big, but the bragging rights are huge. But that’s not important. The USATE is all about spending the weekend playing on a team with friends and having fun. At that, the USATE is one of its kind. Big thank you to organizers (especially Steve Doyle), to my teammates, and everyone else who put the tournament together. All-Girls Tournaments: The Solution to Gender Issues in Chess? I have never taken part in an all-girls chess tournament, but I have always wanted to go to one. I only discovered the All-Girls Nationals my last year of being a scholastic player, but I could not make it. I knew in my heart I’d never get the opportunity to play in an all-girls tournament, but I realized I could live vicariously through all the girls I met at those tournaments. 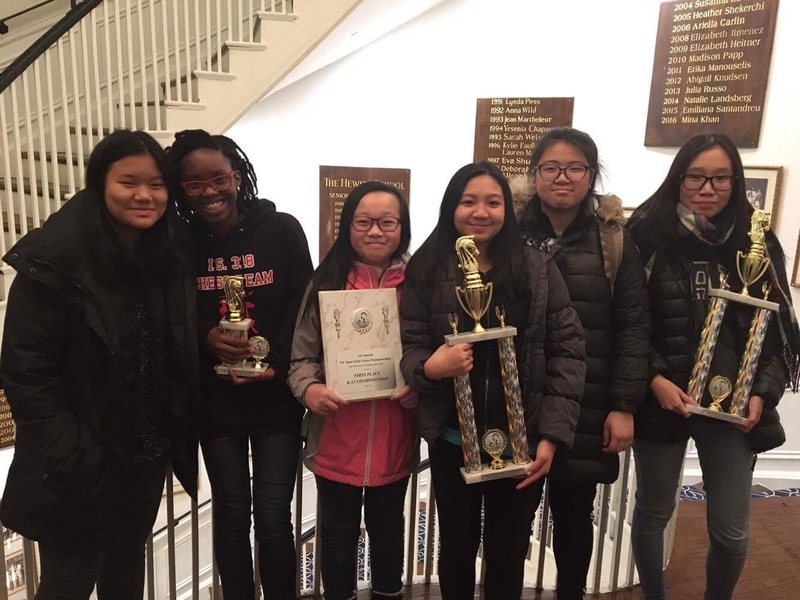 This weekend, I got that opportunity by going to the First New York State Girls Team and Individual Chess Championships, which was held at The Hewitt School on the Upper East Side of Manhattan. 200 or so girls had the chance to experience what I never did, and I was proud of that. It meant that these girls were making friendships and growing as chess players. There was a friendliness that seemed to override the feeling of competition. At many chess tournaments, there is the tension of impending battles over the board, but what I observed in the atmosphere this weekend was more of a camaraderie. Amy Sun, the top seed for the K-6 Elementary Championships, used this in preparation of future tournaments. This was her “first all-girls tournament but she wanted some extra preparation for the All-Girls Nationals,” said her parents. They claimed she had no preference between the ordinary tournaments and an all girls one, however. In fact, Erica Li, tenth place in the K-12 Championship, and Juliette Shang, ninth place in the K-12 Championship, told me that they also saw no difference between the mixed and the all-girls ones. WFM Carissa Yip commented to me personally (she was not at the tournament but had some good thoughts to provide me) that although all-girls tournaments definitely do encourage more girls to play chess, she also didn’t see much difference. WFM Carissa Yip at the US Amateur Team East 2017 | Photo credits: Vanessa Sun. I feel that there may not be much of a difference to the more experienced kids, but the girls just starting out in scholastic chess may benefit from all-girls tournaments the most. After talking to excited kids and parents alike, I decided that at the very least, girls could go to these sorts of tournaments and think that there are other girls just like them who play chess and also think it’s a cool game. It is really obvious in every Goichberg tournament that there is a huge gender disparity, and girls can feel less alone as they understand that there is a community for them. It was clear that underlying the competition was the USCF pushing their initiative to support these female future champions. Right when you walked in, there were flyers for the All-Girls National tournament. There was the US Chess banner for the USCF Women’s Committee, which I had seen at several other tournaments. Surveys were conducted by Kimberly McVay, a member of the USCF Women’s Committee, asking various questions about female involvement in chess. The USCF is currently collecting data in order to understand what exactly they should target in terms of improving conditions for females in chess. Ideally, the USCF’s big goal would be for females to make up 50% of the player population. Currently, they are miles away from their mark, which is evident in every tournament we all compete in. An interesting new change to the USCF website, though, was the addition of more top 100 lists. This was received rather positively by a woman on the Top 100 list for Women Over 50, Maret Thorpe- so much so that she wrote an article on this very topic. I was also personally thrilled to see myself on these lists and found it encouraging to want to move up in my personal rankings. A possible idea proposed by the K-12 Champion of the tournament, Sophie Morris-Suzuki, was that there could be more camps or programs for just girls. Citing Chess Girls DC and Chess Girls NY as examples, Sophie feels that although there are a few camps/programs that are all-girls, they are often for beginners or younger kids. One such example is the United States Chess School , which holds invitational chess camps for the most promising young players in the United States and has held all-girls camps before. She, and I feel that many older players may feel the same, desires more camps for older players. It would certainly help encourage continual involvement in chess beyond the middle school years. She also suggests that there be an increase in women’s tournaments because too much of the gender equality efforts are focused on young girls. It is clear that there is no one solution, but it cannot be denied that the chess community has been failing to actively support female chess players adequately for a long time. Girls and women still face many obstacles in achieving more recognition and success in chess. With these tournaments and new changes, we seem to be improving every day and every year. I myself had the opportunity to connect with both parents and some scholastic players because of this past weekend. Girls tournaments such as the First NYS All-Girls Championship provide a weekend of fun for the female chess players and is no doubt quite the place to feel empowered, supported, encouraged, and to make friendships. 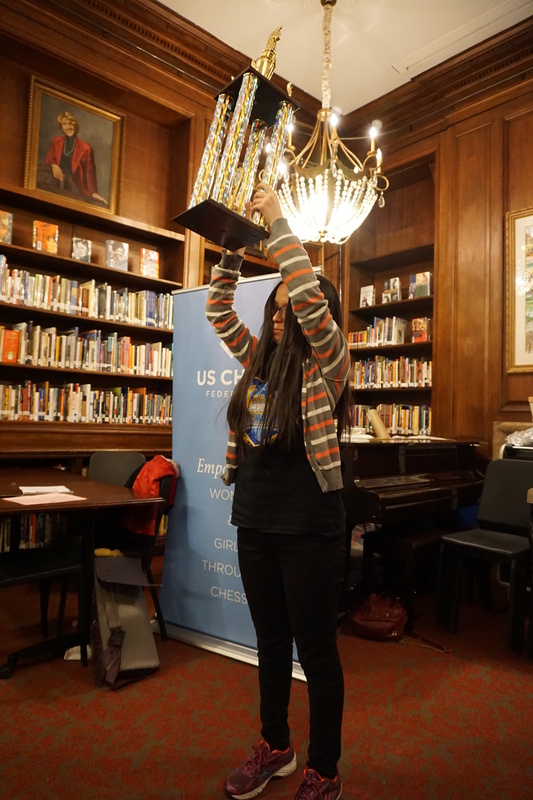 This tournament was made possible because of contributors, The Hewitt School, the New York State Chess association, Little House of Chess, and The Chess Center of New York. There were multiple tournaments held over President’s Day Weekend. I decided to go to the Southwest Class tournament in Dallas, Texas. This tournament had a very strong field with players coming from all over the country. Overall, I am very happy with the way I played there, even though I lost some unnecessary points. I have had many compelling games arise. I picked out one game that I thought had many interesting moments to share with you guys. In this game, I was white against a NM. After a fairly normal opening, I played 12. d4 kicking the knight out of the centralized c5 square. Here, 12…Ne6 would have led to a playable game for both sides. However, the moves leading to this position led me to believe my opponent will play the interesting 12…f4?! which he quickly did. Consequently, an interesting exchange will ensue. 13. dxc5 f3. Now, I have two main ideas. I can either go for a position where I will be up by a pawn but without my g2 bishop, or I can simply back my bishop up to h1. There are two lines that I could have gone to try to grab a pawn. They are 14. Bxf3 and 14. cxd6. After 14. Bxf3 Rxf3 15. cxd6 Qxd6 16. Rd1 Qe7, this position occurs. Black has compensation for White’s extra pawn. The disappearance of the White g2 bishop is obvious, as the surrounding light squares around the White king are extremely weak. Black is not worse here at all because he has multiple ideas of attacking the light squares. It would have been an easy game for my opponent to play. 14. cxd6 would have led to a similar game after 14… fxg2 15.Kxg2 Qxd6. 14… dxc5 delaying the capture of the e2 knight is a possibility. I feel like it would have been slightly better then capturing right away because this would keep the tension. However, I still have a slight advantage after this. I now have a nice, little positional advantage. My light squared bishop is eyeing a beautiful diagonal full of possibilities, my rook is on the open file, and my knight has a bright future on either d5 or c5. My only pieces that aren’t doing much are the b1 rook and the c1 bishop. However after a few moves like b3 and Bb2, my dark squared bishop has potential and my rooks could double on the open file. Overall, this is a very comfortable position. After his last move, my opponent is eyeing my f2 pawn. This is not a problem right now, as my queen is defending the pawn, but I did not feel safe with only one piece protecting me against a possible checkmate by Qxf2. For example, my opponent has Bg4 ideas, which although do not work because of Bd5+, could become a deadly threat. Based on these facts, I decided to play 17. Bg2 creating room for my king on h1 and stopping any Bh3 ideas by black. Now, my opponent made a mistake. 17…Qf7?. He had wanted to remove the queen from possibly being attacked by my knight and place it on a good square eyeing the c4 pawn. It would have been alright had I not had this idea. 18. Bd5! pinning the black queen. 18… Be6. I am 100% sure my opponent automatically saw these two moves before playing 17… Qf7. His mistake may have been that he cut off the variation here, not bothering to look into it further. It would have been easy as it seems like my bishop is tied to d5, since if it moves, the c4 pawn would be hanging. I am up by a pawn and will soon win another. My bishop on c1 and rook on b1 will soon come out and I will have no problems. Black’s knight is misplaced on h5 and his rooks cannot penetrate into my position using the d-file. The game ended up as a straightforward win for white. The most recent tournament I attended was the Liberty Bell Open in Philadelphia this past January. Let’s just say it wasn’t the most successful of tournaments – now I will admit that compared to my performance at Millionaire’s Open last October, it was honestly a huge improvement. Sure, my results were far from beautiful – just 3/7. But after all these years of tournaments, I’ve come to appreciate my game quality a lot more than my game results. Right as the game was about to start, I thought to myself “Ok, you’re going to lose. Accept that. Now just play a good game of chess.” Usually, I hate cliche little sayings like that where we’re giving ourselves pep talks (and honestly if someone else had said something like that to me, I probably would have completely dismissed them), but recently with the overwhelming constant movement of college, I’ve realized how important it is to just take a breath and to start over from the beginning. To stop worrying about the result, and to just worry about whether or not each of our moves are preventing the threats that we can see, if each of our moves have a purpose. Sometimes we get so caught up in the results of what we’re doing, we forget that without the basics, without the little tactics that we developed into our intuition, we would be absolutely nowhere in the game of chess. So just as Isaac emphasize when he first started Chess^Summit, I implore all of you – stop looking at your rating, at your opponents ratings. And just play a good game of chess. It is only then that we can beat the inner us that fights our intuition and logical thinking and blinds us with thoughts of vengeance for a previous loss or paranoia from other games. Me on top of the Haus des Meeres-Aqua Terra Zoo in Vienna. What a view! Two weeks ago, I set foot in Europe for the very first time. Seven countries, five tournaments, three months, and a once in a lifetime trip. Fast forward to the present, and after becoming familiar with the European metro and guarding myself with some very basic German phrases, I’ve started to get into the groove of being a full-time tourist. Thus far, I’ve visited Munich, Lienz, and Vienna, with most of my time thus far spent in Lienz for the Dolomiten Bank Open. Just a city of roughly 12,000 people, Lienz is surrounded by the Alps and is not too far off from the Italian border. Known for its nearby ski resorts, the quaint Austrian city finds itself open to tourists year-round from Europe and across the world. Of course, I wasn’t here to ski, but rather to compete in the Dolomiten Bank Open, one of the premier chess tournaments in Austria. While relatively unknown in the US, the tournament brought players from across the globe: Singapore, Australia, India, Norway, and (with my participation) the United States, to name a few. Even Russian Grandmaster Evgeny Romanov and Magnus Carlsen’s former coach Simen Agdestein tried their hand in what proved to be a tough open section! I couldn’t ski during the tournament, but that didn’t stop me from enjoying the view! Aside from all the packing and planning my accommodations, much of my preparation for this trip was on the chessboard. As you may recall, my last tournament in Philadelphia didn’t exactly inspire confidence, and I was a little worried about how I would fare against European competition. Before I left, I made some decisions about how I would approach tournament play. 1) Don’t get too carried away with prep. Unlike tournaments in the US, most major European events are one game a day, meaning that every game is just one database search away from a comfortable opening position. While getting a good feel for your opponent’s repertoire is a good idea, trying to put together targeted preparation for an opponent you don’t know isn’t impractical (for players rated 2000-2200). In my tournament, three of my nine opponents played a completely new opening or move order, rendering some of my preparation useless. In short, spend an hour reviewing some lines, but then spend the rest of the day exploring the city! 2) Don’t worry about ratings – at all! After the Liberty Bell Open, I decided to not apply to get my European tournaments USCF rated. I was a little worried with how shaky my play was in Philadelphia, and I thought if I had a bad tournament in Europe, the stress to perform could ruin my trip. My FIDE rating started at 1882, so international titles are really out of question. As I’ve said a few times here on Chess^Summit, when in doubt, just play chess! … of course, in deciding to not make this “tour” USCF rated, I passed on a roughly 35-40 point gain (after the FIDE to USCF rating conversion), which would have been my greatest gain in a single tournament since August of 2015. We’ll see how this pans out by the end of my trip, but at the end of the day, there’s no deadline to make master! On the way to the tournament hall! Pictured here is the Grand Hotel in Lienz and the mountains in the background. 3) Don’t be afraid to try new things! With ratings out of the way, tournaments here also give me a chance to play new openings, as well as practice some old ones. I had five whites this tournament, but I chose not to play my favorite opening, the English, at all! Barring a single game against fellow Chess^Summit co-author Beilin Li, I had played the English with every game as White dating back to 2014. In what proved to me to be my biggest surprise of the tournament, I scored an unbeaten 4/5 against stronger opponents from the White side of the board. I couldn’t get a result in the second round, but I did bring the “surrender cobra” to Europe! In my first European tournament, I put together a solid 4.5/9 in a strong open section. My FIDE rating looks to gain upwards of 50 points, and I’m a lot more confident in my play with less than a week to go before the Liberec Open. I still think there are areas of my game that need to improve, but when comparing this tournament to past outings like the Liberty Bell Open or the World Open, I’m very pleased with my progress. Here are some of my over the board highlights! It wasn’t clear I would get an even score until the end of the tournament. Thanks to some jet lag and poor calculation early in the tournament, I started 2/6 and was in need of some points. Luckily, I was able to finish the last three rounds 2.5/3, thanks in part to a quick win in round 7. Black just played 10…Ba6, what’s the easiest way for me to attack Black? I would say I thought the most on this move, and then the rest of the game finished relatively quickly. This was a great win, especially since I tend to win more positional games than tactical ones. I think winning this game the way I did gave me a lot of confidence in the last two games. After putting together a weird draw in the eighth round, I sat at 3.5/8 with one chance with White to get an even score. While it’s a known cliché to draw the last round, I really wanted to win, and I pushed myself. Luckily for me, I was rewarded and after dominating the whole game with White, I managed to put away my opponent with a nice move here. Can you find it? King safety once again proves to be the key theme! With this nice zugzwang idea, I clinched my third win of the tournament and finished 4.5/9! With a few days to rest before my next tournament, I’m visiting Vienna and Prague on my way to Liberec, Czech Republic. Though I have yet to see Prague, I have to say Vienna is a must-see city. While the city has grown to meet 21st century demands, its maintained its historical foundation and culture. Though I’ll only have two full days here, there’s so many things to do – visit the Schönbrunn Palace, go to the Museums Quartier, or simply just walk the streets near Stephensplatz. Hopefully when I spend a day here in March on my way to Budapest, the gardens across the city will be greener! My next post will be on March 7th, where I will be writing from Dresden after having finished the Liberec Open alongside Pitt teammate John Ahlborg! Until next time! A polar bear about to dive in the Tiergarten Schönbrunn. The zoo was founded in 1752! How did Pittsburgh pull out the narrow win against Portland? Relive the Game of the Match here!